Posted 21 August 2013 under Ask Us. Is it ok to use small scissors and a mirror and trim your pubic hair, just along the underwear/swimsuit line where the hair sticks out? I don’t want to remove it all, because I’ve heard shaving can be tricky, and even painful. Is this true? Please help! Yes. 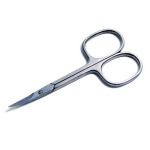 It’s perfectly fine to carefully trim your pubic hair with small scissors along your swimsuit or underwear line. Many girls trim their pubic hair, or go to a salon to have a “bikini wax”; others prefer to shave just about every day, and many just leave it alone. Removing pubic hair is a personal preference. It’s not necessary to remove the hair in this area to keep your body clean.